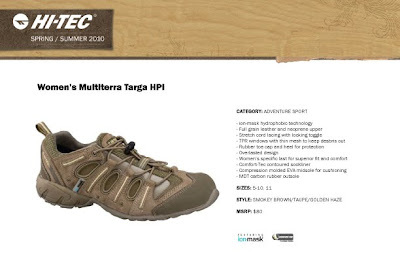 A few weeks ago, Liz and I were very blessed to receive the Hi-Tec Multiterra Targa HPi shoes for review. 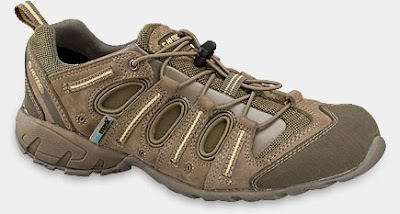 These shoes are made by the Hi-Tec Shoe Company of Modesto, California. Established in 1978, Modesto, CA-based Hi-Tec Sports USA, Inc. pioneered the original lightweight hiking boot. Today, Hi-Tec Sports USA continues to design and develop authentic outdoor footwear to meet the needs of the ever-evolving outdoor consumer, while Magnum USA, a division of Hi-Tec Sports USA, leads the uniform and work footwear markets. Hi-Tec Sports USA launched distribution of Golf footwear in 2003. The privately owned parent company, Hi-Tec Sports, based in the United Kingdom, leads the market in golf, court and outdoor footwear categories. Hi-Tec Sports distributes in over 70 countries, forming a global footwear enterprise and selling over 10 million pairs of footwear annually. Liz and I have been living in them wearing them daily. They are just that comfortable! I admit, however, that Liz has put hers through the ringer while I've been a bit more laid-back in mine! These shoes are really amazing. They offer support where you need it most, they breathe, they conform well to the shape of your foot, and they are durable. What more can one ask from a shoe? What more can a parent ask for their child's shoe? COMFORT-TEC®Hi-Tec’s three-tiered insole innovation puts extraordinary comfort technology under your feet. Comfort Tec features a moisture-wicking, contoured EVA footbed to cradle and support your foot, while CT Plus adds an odor-fighting Poliyou® mid layer. CT Custom incorporates viscoelastic memory foam for individualized fit and cushioning. They are also very stylish -- The colour, Smokey Brown / Taupe / Golden Haze, is subdued and you can wear them with jeans or even nice slacks. I like them best for their sheer comfort. How nice it is to be able to put on a pair of shoes and be able to stay in them all day for whatever purpose the day brings. So, how have we put our Hi-Tec Multiterra Targa HPi's to good use? LIZ: I've spent a lot of time out with my BF on the four-wheeler mud-boggin'. We trampled thru the mud and the fields out past the railroad tracks and back. The Multiterra Targa HPi's were totally cool. I wasn't slipping and falling because the soles have good grip. When I took them off later, my feet weren't all wet. I HATE getting my feet all yucked up, so that was really nice. When I rinsed the shoes off it didn't take them long to dry out, either. My sneakers take forever to dry naturally, sometimes a couple of days. My Targas dried overnight and I wore them to class next morning. It's nice to have a shoe that has dual purpose. I can use them whenever and however I want. If there is anything I don't like about them, it's that it's kinda hard to get on at first because they're tight and there's no 'tongue' to pull on. But that goes away after you've worn them for a while. It's so cool not to have to fight with shoes laces, too. No worrying that they'll come undone and you'll trip all over yourself. I really like these shoes. Terri: I haven't been mudbogging. :) But I do a lot of standing and walking. So comfort and functionality is everything to me. You see, I have a very specific pair of shoes for my "weight loss" walks (stop laughing) -- but they're specifically designed to be used for a short period of time per day. So, I need shoes for the rest of my day -- and the Targa fits my every need. I have high arches -- support is a must. The Targa provides that support. Like Liz, I appreciate the fact that shoe 'breathes' -- no sweaty feet. My feet don't hurt after wearing them all day. What a relief -- literally. I haven't been out in the deep mud and muck as Liz has done (I'm an indoorsy kinda gal) but I've managed to take step off of the deep end of the ridges in my front yard. (Not my fault... but I did get Mike's truck stuck in the mud in my own front yard). Liz is right... rinsed the shoes off, set them up to dry and by next morning, I was able to wear them -- no problems. The Women's Multiterra Targa is available in sizes 5-10 (+ half-sizes) and 11. I found that if you have a wide foot (and I do), you may need to go up one size. Liz, however, has a fairly narrow (average) foot and the shoes fit her true-to-size. The Targa is also available in a Men's Version! -- size 7-11 (+ half-sizes) and 13. 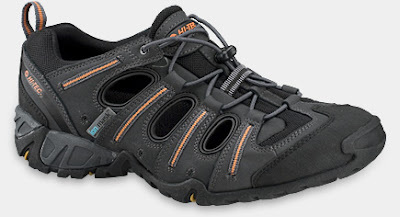 You can purchase Hi-Tec Shoes at their On-Line Store! Hi-Tec USA on Facebook -- Tell them Terri & Liz from Gathering My Roses sent you! 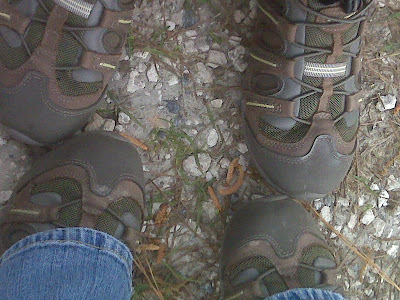 DISCLAIMER: Liz and I each received a pair of Multiterra Targa shoes for the purpose of review. We were under no obligation to review these items. We received no monetary compensation. The opinions expressed herein are our own and are based on our personal use and experience with the shoes.